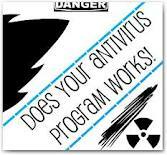 After installing Antivirus, you may logically wonder, how do I know if it’s working? The answer is a TEST VIRUS. All you have to do is to copy and past the following code mentioned below in a notepad file and follow the instructions below…. The file size will be 68 or 70 bytes. If Antivirus is running and configured correctly, when you try to save the file, real time scanner will detect the virus. If it is not running, start it and scan the directory that contains freehark.tk. When your software scans this file, it will report finding the freehark.tk file. Note that this file is NOT A VIRUS. 4. Change the ‘Save as Type’ to ‘all files’. If the real time protection will be turned on in your antivirus….which it should be……it will automatically detect the test virus and perform the required action….! Else manually run the antivirus and scan the directory where you saved the file and see the results…. !